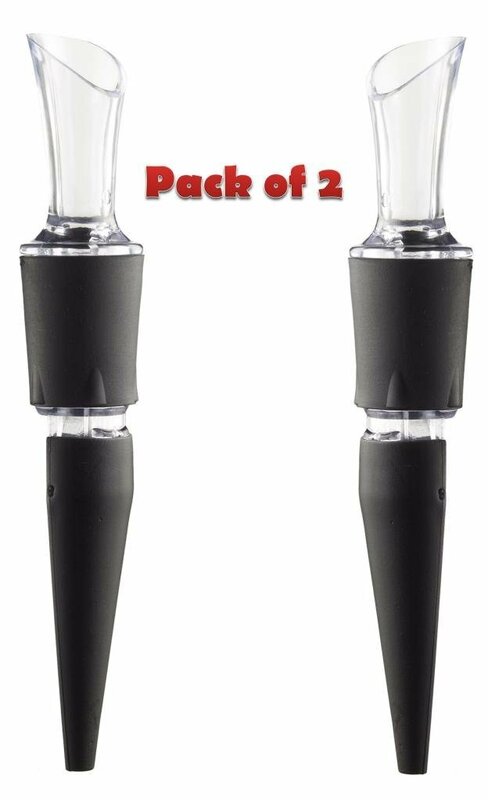 This set of two wine aerators from AeraWine are great. Just insert one into the bottle of win and then pour out into the glass to aerate the wine. These are well made and pour the wine without leaking. Instantly improve the taste and quality of the wine. I love these because you can just insert them right into the bottle, no messes from transferring it from bottle to glass through aerator and back to glass. The taste was improved when I used these. It’s a great way to improve your win and these are nice and easy to use. I love that you get a set of two as well so you can have one for the white and red at the same time. You can use these on other drinks besides wine, it works for whiskeys and spirits as well. This innovative bottle-top aerator infuses wine air as it’s poured from the bottle – immediately enhancing taste, bouquet, and smoothness.This innovative bottle-top aerator infuses wine air as it’s poured from the bottle – immediately enhancing taste, bouquet, and smoothness. Also aerates spirits and liquors for smoother taste. Unique friction-fit design pulls apart for easy cleaning. Simply insert the AeraWine into the bottle with a slight twist to ensure an airtight seal. Tilt the bottle at a steep angle for maximum aeration. You can purchase these aerators on Amazon!